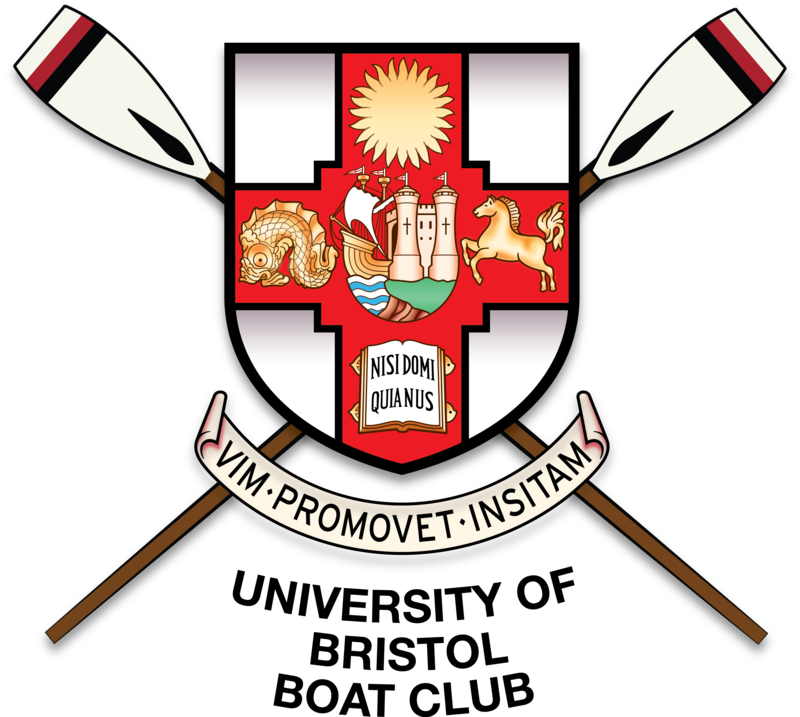 On Saturday the 23rd of March, our women’s first eight travelled to London to partake in a fixture against Cambridge University’s Women’s lightweight eight who are in the final stages of preparation for their varsity boat race against Oxford’s lightweights on Saturday 30th in Henley. 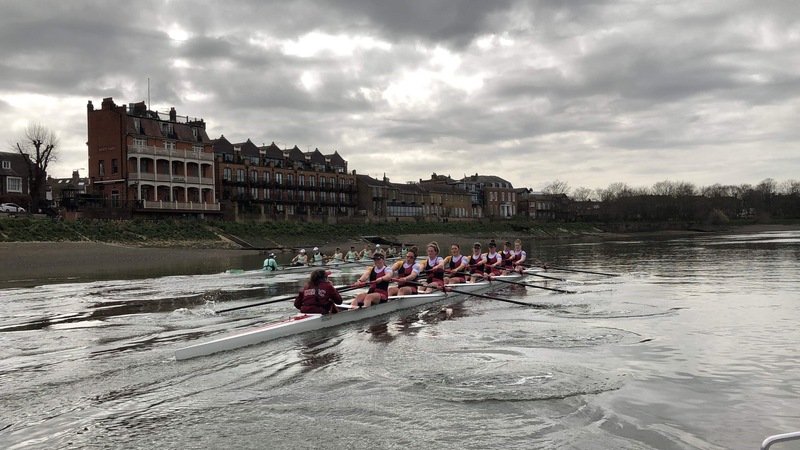 A few weeks prior to this match, our women took on the Oxford lightweights at Dorney in a series of pieces in which Oxford came up top and proved to be a very competitive crew. Off the back of that, we knew we’d face similarly tough competition from Cambridge. 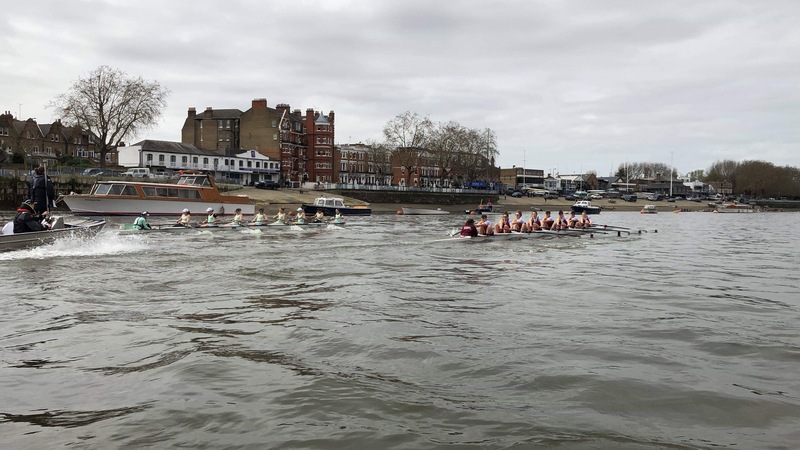 We arrived at the Tideway bright and early on Saturday, giving us time for a pre-paddle before taking to the water again to battle it out in two 1600m pieces over the Boat Race course (the reverse of the HORR/WEHORR course). Our first piece started off very strong with us shooting out of the blocks and gaining a lead of about half a length over our opposition. However as we came into the second half of the piece, it became clear that Cambridge were better prepared for this length of race as we were unable to maintain the speed we attained in the first half. The paddle from the end of the first piece to the start of the second piece a few kilometres upriver allowed us to catch our breath and briefly discuss our approach for the second piece. We went out with the same intent but Cambridge seemed to have caught on to our fast start and matched this with an explosive start of their own, allowing them to slowly gain a lead on us. Although Cambridge took the win in both pieces, it was a very beneficial day for our crew and it was an honour to have been invited to this event which also saw matches between other Oxford and Cambridge crews with top performing clubs such as Molesey, Leander, and Imperial College. We wish both crews the best of luck for what should be a very exciting race this weekend, and hope to see them again next year for some more racing.